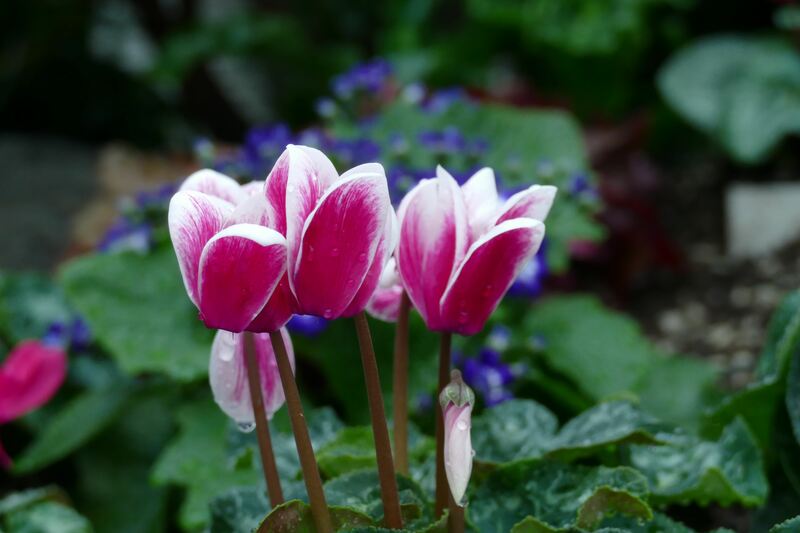 Cyclamen flowers dotted the Sunken Garden display. Even though it’s felt like we live in Seattle the past — oh, maybe — four months, it is still January in Minnesota. That means short days, cold temps and a chance to escape at the Marjorie McNeely Conservatory at Como Park. I love, love, love the conservatory, especially in January. The air is moist, the temperatures are flirting with 75 and every winter, the folks at the conservatory bust out the azaleas, the lilies, the cyclamen and assorted other colorful plants for the annual Winter Flower Show. Yesterday, I wandered through the display and once again felt huge amounts of gratitude to the St. Paul visionaries who thought a public conservatory would be a good idea back in 1915. This year’s winter show started Saturday and runs through March 10. Because it is early in the show, not all of the flowers were open, but the bright pinks, purples and rose hues made the Sunken Garden a bright spot in our otherwise dreary and snowless landscape. As is typical at the conservatory, a mix of families with young children, couples, older adults and photographers were at the conservatory Monday afternoon. 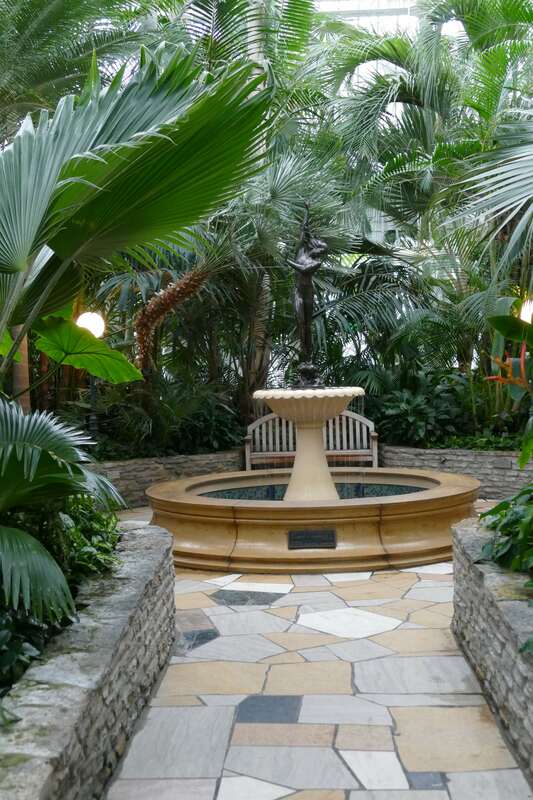 You enter the conservatory through the Fern Room, which features a waterfall and gives you the first taste of the tropics. You enter the Sunken Garden through the Palm Dome, which features banana plants and other tropicals. Most of these are green now, but the bright orange blooms of Parrot’s Beak Heliconia added a splash of color. The Palm Dome has a center fountain, surrounded by seating, where many visitors take a break to just look up at the dome and the palms that almost touch it. 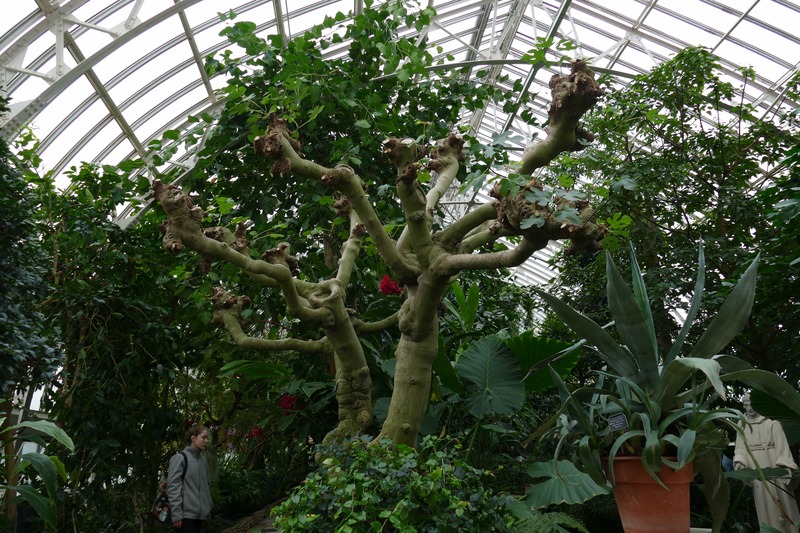 This fig tree was pollarded to control its growth in the North Garden. The North Garden includes a larger water feature, flanked on one side by a large statue of St. Francis and on the other by a fig tree. The conservatory gardeners do a great job of educating visitors through docents and signage. The fig tree was look particularly bare during my visit, but a nearby sign explained that it had been “pollarded,” a technique used to control the size of plants that cannot be allowed to reach their full size (such as those in conservatories). Mona Lisa lilies are beautiful and fragrant. A model posed for a photographer behind this statue. 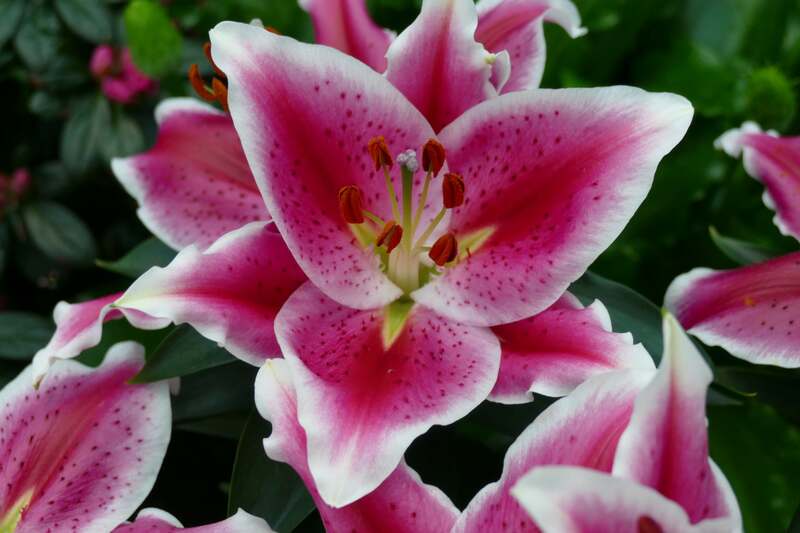 In the Sunken Garden, the scent of the gorgeous Mona Lisa lilies added a summerlike feel to the garden. The display is a mix of azaleas, lilies, amaryllis and cyclamen along with pansies and other annuals. The reflecting pool adds a serenity to the space, and there is always something interesting going on. A young woman was posing for pictures for a photographer, and I could not help but think she struck a pose not too dissimilar from the statue in the pool. After an hour in the conservatory, I had a camera full of photos and felt more cheerful about the rest of winter. I may be back, though, because the conservatory has music every Sunday evening during the winter. A variety of jazz, bluegrass and rock performers are on the docket. Just the thing for a winter weekend. Have you visited the conservatory? What’s your favorite plant there? An inviting spot to sit and enjoy the greenery.